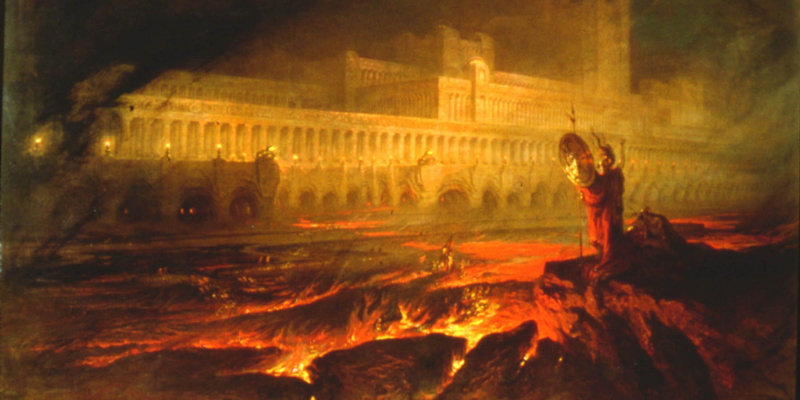 Why Do the Scriptures Compare Hell to an Unquenchable Fire? Therefore if that man repenteth not, and remaineth and dieth an enemy to God, the demands of divine justice do awaken his immortal soul to a lively sense of his own guilt, which doth cause him to shrink from the presence of the Lord, and doth fill his breast with guilt, and pain, and anguish, which is like an unquenchable fire, whose flame ascendeth up forever and ever (Mosiah 2:38). Although the precise ancient Israelite understanding of “hell” is not clear from the text of the Hebrew Bible, the idea of a place for the wicked to endure the fiery wrath of God appears in a number of passages. Isaiah 26:13–19—Although the wicked dead are punished, the righteous dead will arise and shout for joy. Jeremiah 7:31–32; 19:1–15—Just as the people of Jerusalem sacrificed their children and burned incense to false gods at Topheth/Gehenna, the Lord would likewise make it a place for the punishment of His people. It is apparent from these examples that around the time that Lehi left Jerusalem, and well before, the valley of Hinnom (Gehenna) was associated with burning, destruction, and the fiery wrath of God in the minds of the inhabitants of Jerusalem. This was clearly still the case in New Testament times. Although this imagery was apparently familiar to King Benjamin and is referenced in his use of the words “unquenchable fire” and “flame,” he, or the angel of the Lord who had revealed these doctrines to him, chose to speak of the concept of eternal punishment metaphorically. The text states that this torment is “like an unquenchable fire” (Mosiah 2:38, emphasis added) and “as a lake of fire and brimstone” (Mosiah 3:27, emphasis added). Benjamin’s speech goes on to build upon this metaphorical sense as he emphasizes that these feelings of fiery wrath do not come from an actual pit of fire, or the like, but from the sinner’s awakening “to an awful view of their own guilt and abominations,” which “doth cause them to shrink from the presence of the Lord into a state of misery and endless torment” (Mosiah 3:25). This sense of guilt, says Benjamin, “doth fill his breast with guilt, and pain, and anguish, which is like an unquenchable fire, whose flame ascendeth up forever and ever” (Mosiah 2:38). This concept of experiencing “hell” through the pain and anguish of a guilty conscience can be found in the Old Testament as well. The Psalmist, for example, lamented that “the sorrows of hell compassed me about” (Psalm 18:5) and that the “pains of hell gat hold upon me: I found trouble and sorrow” (Psalm 116:3). These sentiments parallel with those of Alma the Younger, who recounted that he was “tormented with the pains of hell” and “harrowed up by the memory of my sins” when he remembered his rebellion against God. He wished that he “could be banished and become extinct both soul and body, that I might not be brought to stand in the presence of my God, to be judged of my deeds” (Alma 36:12–17). Hide thy face from my sins, and blot out all mine iniquities. Create in me a clean heart, O God; and renew a right spirit within me. Cast me not away from thy presence; and take not thy holy spirit from me. Since King Benjamin emphatically warned of the pains of hell in his famous covenant speech to all of his people, it is good to wonder why it was so important for him to communicate that topic to them. What methods does he prescribe for them to avoid this “awful situation” (Mosiah 2:40)? The Book of Mormon teaches that Satan and hell are real. King Benjamin wanted his audience to understand the pain and anguish of guilt that comes from sin. Throughout his speech, he then gives many instructions about how this “unquenchable fire” can be avoided. For example, King Benjamin was concerned to unite his people and prevent rebellion among them. In Mosiah 2:32, he admonishes them to “beware lest there shall arise contentions among you,” warning them that in doing so, they “list to obey the evil spirit.” Jesus would later warn the Nephite people of the same evil (3 Nephi 11:29). Benjamin advised his people that whoever decided to obey the evil spirit and remained and died in their sins “drinketh damnation to his own soul; for he receiveth for his wages an everlasting punishment, having transgressed the law of God contrary to his own knowledge” (Mosiah 2:33). For the natural man is an enemy to God, and has been from the fall of Adam, and will be, forever and ever, unless he yields to the enticings of the Holy Spirit, and putteth off the natural man and becometh a saint through the atonement of Christ the Lord, and becometh as a child, submissive, meek, humble, patient, full of love, willing to submit to all things which the Lord seeth fit to inflict upon him, even as a child doth submit to his father. And moreover, I would desire that ye should consider on the blessed and happy state of those that keep the commandments of God. For behold, they are blessed in all things, both temporal and spiritual; and if they hold out faithful to the end they are received into heaven, that thereby they may dwell with God in a state of never-ending happiness. O remember, remember that these things are true; for the Lord God hath spoken it. Dahl, Larry E., “The Concept of Hell” in A Book of Mormon Treasury: Gospel Insights from General Authorities and Religious Educators (Provo, UT: Religious Studies Center, Brigham Young University, 2003), 262–79. Emile Puech commented on these verses: “judgment and punishments of the wicked are opposed to the resurrection of the just in a context of collective eschatology, and God has destroyed death forever (Isaiah 25:8).” Emile Puech, “Jesus and Resurrection Faith in Light of Jewish Texts,” in Jesus and Archaeology, ed. by James H. Charlesworth (Grand Rapids, MI: Eerdmans, 2006), 644. Tophet (or Topheth, Tophteh) was a section of “the valley of the Son of Hinnom” (Heb: Gai Ben-Hinnom; later “Gehinnom” in Hebrew or “Gehenna” in English translations) which was situated just south of Jerusalem. The Israelites are accused of burning their children to Moloch and other Canaanite gods at this place, a crime for which it was understood to be cursed (Jeremiah 7:31; 19:2–6). See, e.g., Matthew 5:22, 29; 10:28; 18:9; 23:15, 33; Mark 9:43–47; Luke 12:5; James 3:6.